The Herschel Space Observatory (Pilbratt et al. 2010) was launched on May 14th, 2009, to study the Universe in the submillimeter wavelength range. It carried three instruments: the Heterodyne Instrument for the Far-Infrared (HIFI ; de Graauw et al., 2010), the Photodetector Array Camera and Spectrometer (PACS ; Poglitsch et al., 2010), and the Spectral and Photometric Iaging Receiver (SPIRE ; Griffin et al., 2010). 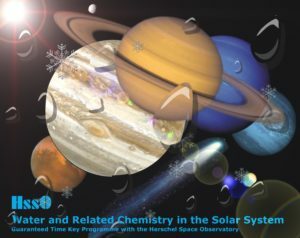 The He rschel Guaranteed Time Key Program “Water and related chemistry in the Solar System” (PI: P. Hartogh, MPS, Germany), also known as “HssO” (Herschel Solar System Observations), proposes to determine the origin, the distribution and evolution of water and its isotopes in the atmospheres of Mars, the outer planets and Titan, and the comets (Hartogh et al. 2009). The D/H ratio has been measured in the atmospheres of the giant planets and some comets to constrain the composition of the primordial ices of the Solar System (Feuchtgruber et al. 2013, Lis et al. 2013, Bockelée-Morvan et al. 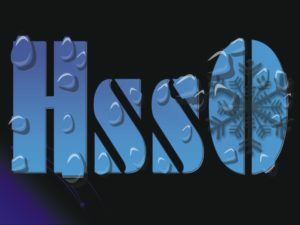 2012, Hartogh et al. 2011). The water cycle of Mars is studied by monitoring the vertical profile of this species. Retrieving the vertical profile of water in giant planet stratospheres is key in assessing the type and magnitude of their external oxygen sources. Reference: Hartogh et al. 2009, Planetary and Space Science 57, 1596-1606. Next PostNext A cometary origin for CO in the stratosphere of Saturn?